Wondering whether or not you should hire a professional landscape design company to complete your backyard oasis? Read more…In this article, we will talk about 11 reasons why hiring the professionals is the best choice! Would you try to install a new home electrical system if you’ve only ever taken one electrical systems class in high school? Most likely not…and we hope not! Chances are you’d call your local electrician to do the job. What if your dream backyard entails a saltwater pool, beautiful plants and shrubs, windy walkways, sidewalk lighting, and a huge deck? Would you tackle these projects yourself or hire the experts? If you want the job done right and everything installed and built properly, you would hire a professional landscape design company. At Outside Landscape Group, we are experience “certified” Landscape Architects seasoned with years of experience in both Design and Installation providing you a creative vision that is practical works well on your site. We have a well-designed, 4-step process to complete your landscape design. Click here to learn more about our process. Also, if you are interested in hiring us for your Alpharetta, GA home (or the surrounding area), contact us here or call us at 770-481-8335. 2. Professional landscapers have excellent ideas that work. Since professional landscape companies have years of experience with a wide variety of great customers, they are familiar with certain designs and ideas. At Outside Landscape Group, we have many, many customers, and we perform research to gather even more ideas. Based on our customer’s designs, we know what works and what does not work. There are some backyard spaces that cannot have certain features built in, based on architecture, slope of your yard, and other elements. We are familiar with certain ideas and landscape designs that work well. Knowing this information can help save you money, time, and effort in the long run. When you hire us, you aren’t just getting a landscape company, you are hiring a team of consultants that can help you design and implement your own personal backyard sanctuary. To see before and after pictures of our completed designs, visit our before and after page. 3. Professional landscapers know how to avoid common pitfalls. Similar to point #2 mentioned above, we know how to avoid the most common pitfalls that sometimes arise during landscape design and building. Knowing these elements can undoubtedly save you money, and can speed up the entire project. An example: say you were doing the landscaping yourself and you planted several plants and shrubs in your front yard and backyard (plants and shrubs that need consistent watering). Well, in your project’s design layout, did you include the plans to install an irrigation or a sprinkler system? Who will water the beautiful plants and shrubs, especially during a drought or a dry spell during the sweltering Georgia summers? Our professionals at Outside Landscape Group know this is one of the common pitfalls homeowners may experience when trying to complete landscaping themselves. There are many pitfalls that we are aware of (through experience and research). We do our very best to avoid them. Relating to this specific example, we would include an irrigation or a sprinkler system in our landscape design plans. Knowing that you need a watering system in place before the project starts will save money so you don’t have to rip out your newly planted shrubs in order to install an irrigation system later down the road. That just sounds like a headache! 4. Professional landscapers will help you design your own personal oasis. Maybe you have looked at home magazines to help design your backyard. You probably have so many ideas to implement, but how do you do it? How do you logistically accomplish this task the right way? You hire a professional landscaping team. Our landscapers have many years of experience building and designing backyards and front yards. With the depth and experience in Landscape development, we can efficiently provide you with a plan that includes your wish list in a seamless plan that also works with your budget. What felt overwhelming and difficult to put together, now can come to life with ease! If you are interested in hiring us, contact us here or call us at 770-481-8335. 5. Professional landscapers can conceptualize your landscaping and help you maintain your budget. Tackling a huge backyard makeover by yourself is not recommended. A lot of planning and designing goes into it, not to mention the tools to implement your ideas. Outside Landscape Group will take care of all of this for you. When we meet in the beginning to discuss your project(s), we will also talk about your budget. We keep this in mind so we can create a beautiful outdoor space for you and not hurt your wallet so much. Also, we are well aware of how much materials cost nowadays. If you are budget-conscious, we can determine how to give you an outdoor paradise without going over your budget. 6. They are well-versed with your local climate. The climate in your region is a very important factor when designing your landscaping. You want to make sure your landscaper is well-versed on the local climate near your home. You surely do not want to plant shrubs that will not survive throughout a harsh winter. You also want to consider which types of flowers, shrubs, etc to plant—- perennials, annuals, etc. Another example: If you are considering a Deck or Patio, weather including sun, shade, drainage, run off…all items climate related are different on each site and we will take this into consideration. The proper material choice, location on the property and size of living space needs to be considered for a successful outdoor space. During our initial meeting, we can discuss the weather elements and how they will play a part in our design. 7. Professional landscapers typically offer several services to help you. Broadening your options can be a very good thing. When hiring a company to complete your landscaping design, you can also take advantage of all other services they offer. With the combination of any of our services, we know you will absolutely love your brand new backyard oasis. It’s about more than specific services though. It’s about designing an outdoor lifestyle for you and your family. 8. Professional landscapers can do the job right. Professionals typically have several years of experience, which will benefit you as the homeowner. Outside Landscape Group not only has experience with landscape design, lighting, and more, but we also know how to do the job right. For instance, longevity and landscapes that flourish overtime are important to homeowners. Engaging experts and professional craftsman will ensure that your project is built properly and put together correctly. Outside Landscape Group is proud of their reputation of building successful landscapes that stand the test of time and increase in value and beauty over the years. Outside Landscape Group has a well-designed, 4-step process to complete your landscape design. Click here to learn more about our process. You want to hire the professionals to do the job right. If you are interested in hiring us for your Alpharetta, GA home, contact us here or call us at 770-481-8335. 9. A Professional will consider all the aspects of your landscape…Landscape Lighting adds a final touch! Do you want to install beautiful landscape lighting but have no electrical experience or the tools to do the job right (and safely)? Our landscape company has installed many types of landscape lighting for our customers. We are knowledgeable of different types of lighting options that are perfect for outdoors. Most importantly, we follow all safety precautions to install the lighting professionally and the right way. This will surely give you peace of mind while enjoying and entertaining with a well thought out landscape lighting design and installation. Lighting will provide safety, security and an ability to enjoy your outdoors during the evening. To see some of our work, visit our gallery page. 10. Want a pool, stream, or a pond installed? Professional landscapers can help. Do you have a backyard design in mind already, but wondering whether or not you can also have water features installed? Wondering how extensive of a project this is and if you can afford it? From fountain installation to waterfalls (and other water installations), Outside Landscape Group can customize your outdoor water features. We can talk about this during the initial meeting to determine if this is a good decision for you. 11. Want to build a deck, patio, or a porch? Professional landscapers can design and build, too. Have you always wanted a spacious backyard deck or patio, but you don’t know who can build it for you? A professional landscape company like Outside Landscape Group can help you. In addition to specializing in patios, we have completed various custom carpentry solutions for customers. If you want a stunning custom pergola, deck, pool house, or porch, call us and we will be happy to discuss your options, and help you choose the design that is a perfect fit for your yard! If you are interested in hiring us for your home in the Alpharetta, Roswell or other north Atlanta suburbs, contact us here or call us at 770-481-8335. At Outside Landscape Group, we want to bring your version of paradise right to your very own backyard. Give us a call today and find out how we can design the ideal outdoor living space for you and your family! The fall & winter months are the PERFECT time of year to sit near a cozy fire and just relax. Wouldn’t you love to do that in your OWN backyard? 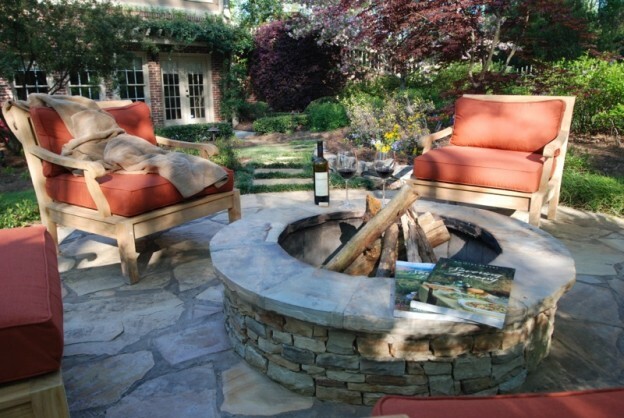 Now you can create this perfect oasis when you hire Outside Landscape Group for your fire pit installation! We serve Alpharetta, Roswell, and the surrounding North Atlanta suburbs with high-quality fire pit construction and installation services. Whether you choose an outdoor fireplace or an outdoor fire pit, our professionals can plan and install these features for you. We have years of experience with building these types of projects. As a matter of fact, you can view images of our completed projects so you can see for yourself! 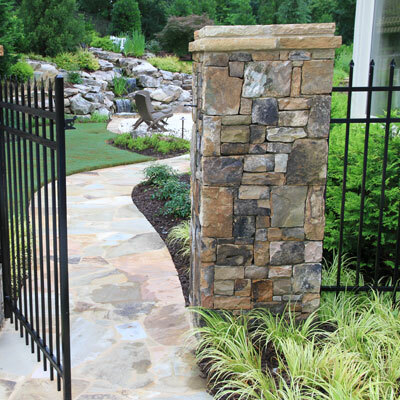 When you choose Outside Landscape Group, you can look forward to a seamless, worry-free process. Actually we have a 4-step process in place to start and complete your project. Getting acquainted. We will discuss your project goals and ideas. This will help us plan your project the way you like. Creating the plan. Our team of professionals will integrate your goals and ideas in order to create the project plan. This plan will lead us throughout the entire project. The value of “design build.” We will match your project ideas in a creative way that fits your budget. Building your project. This is the phase where we implement the ideas. Our in house masons will strategically and creatively build your fireplace or fire pit with the very best craftsmanship and details. Interested in installing a fire pit or outdoor fireplace, but you are also curious about other backyard features? We offer many services at Outside Landscape Group to cater to your needs and satisfy your backyard dreams. From custom carpentry designs, landscape lighting, to putting greens and sport courts, we have all of your backyard design needs in one place! To learn even more about each of our services, visit our services page and click on the service of interest. You can begin to get more ideas of how you would like your backyard to look. If you have any questions, please feel free to call us. If you are interested in designing and installing an outdoor fire pit in Alpharetta, Roswell or the surrounding North Atlanta area give us a call today to get the process started. Also, if you are interested in any of our other services, we invite you to browse around our website. If at any point you have questions, please contact us. We will be more than happy to speak with you. As always, we know you will not be disappointed with our services and with your new backyard haven! You walk outside on your deck or patio (maybe beside your pool area), and have a fully-equipped, outdoor kitchen where you can grill your favorite foods, and enjoy them with all of your family and friends while entertaining. At Outside Landscape Group in Alpharetta, GA, we believe that your landscape is about much more than well manicured flowers, shrubs and trees. Your yard, when utilized correctly is an extension of your home and the lifestyle you want to live. We want to help you make an outdoor kitchen part of your lifestyle, and are going to give you a few of the most important things you should consider when building an outdoor kitchen. What Size Area do You Need for Entertaining? When you are in the initial planning phase for your outdoor kitchen, it is important to think about the size of the area you will need for entertaining. Think about how many people you would like to accommodate, as well as how much space you want everyone to have. Make sure to think beyond just your immediate family, because with an outdoor kitchen your home is likely to become the preferred hangout for all of your friends and family when it comes to outdoor activities! Just like when designing your overall landscape, you must take into account the location and layout of your outdoor kitchen. Think about which door you’ll want to come out of to get to your outdoor kitchen, how far it is from other features in your backyard (such as your pool, spa, or even an outdoor putting green or sports court), and which direction you would like to face when cooking and entertaining others. The specifics of location and layout are essential when planning the ideal outdoor cooking and entertaining space. We’ve seen this happen before (I’m sure you have as well) and it is painful to see. Oftentimes, a homeowner will build a great-looking outdoor kitchen, but it doesn’t fit the look and feel of the house, or the surrounding landscape and hardscape. Even if your outdoor kitchen is beautiful by itself, it is essential that it blends in well with the surrounding environment. As an extension of your house, our goal at Outside Landscape Group is to make sure your outdoor living area looks natural, like it was meant to be there the whole time! An outdoor kitchen is more than just a grill and countertops. Think about all of the features your indoor kitchen has (or doesn’t have) that you would like to have available in your outdoor kitchen area. 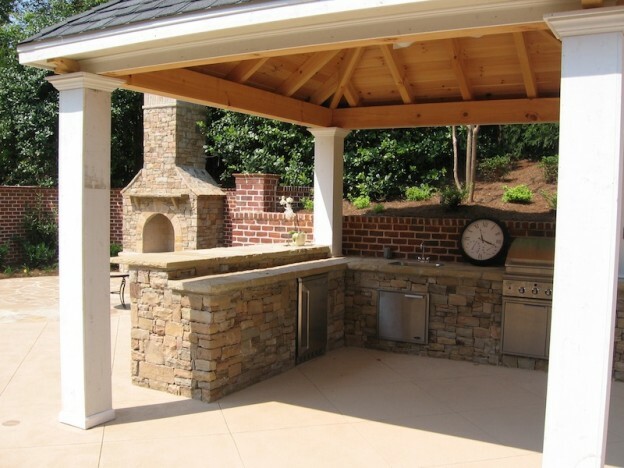 At Outside Landscape Group, we’ve constructed countless outdoor kitchens in the Alpharetta and Roswell area, and can provide you with direction and insights as to what most people enjoy having as part of their outdoor kitchen area. Even if you don’t plan on building your outdoor kitchen for months, it is important to go ahead and get the planning and design phase in the works. Many people wait until Spring, only to realize that Outside Landscape Group, along with other reputable companies in this field are booked solid for several months. So, don’t wait and miss out on getting your outdoor kitchen. Whether you are looking to start construction in 3 days or 3 months, we want to hear from you! Give us a call today at 770-481-8335 or contact us here to schedule an appointment with us at your home! Just because your grass may be going dormant this time of year, doesn’t mean that your creative juices should go dormant as well. At Outside Landscape Group, we help our clients with a variety of landscaping projects year-round, including the cold winter months. If you’re looking for some winter landscaping ideas for your Atlanta area residence, here are a few projects that we typically work on for our clients during the winter months. If you would like our help with your winter project, or have another landscaping idea you would like to discuss, please contact us here. We would love to discuss your project! Foliage growth comes to a halt and plants go dormant. However, roots continue to grow and plants get acclimated to the cooler temperatures. With less heat, watering requirements go down, and you can rely on Mother nature to water your plants for you. When Spring rolls around, plants will tend to flourish with foliage and flowers since the roots system has already been established months earlier. Since many people plant in the Spring, there is a great choice of quality plants in stock at local nurseries for Fall and Winter planting. 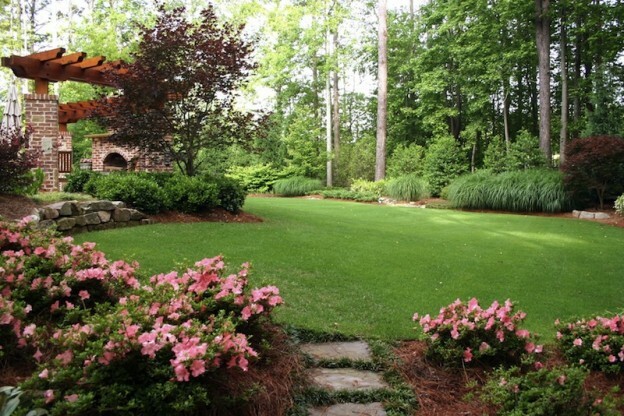 As you can see, colder months are actually a great time to plant in your Atlanta area yard! When it’s light outside for 14+ hours each day during the Summer months, many people don’t really think about landscape lighting. However, in the late Fall and Winter when it starts to get dark earlier and the holidays are just around the corner, adding landscape lighting becomes an essential. During the Winter (holiday) months, you may have family and friends over for holiday parties, and want to ensure their safety around your home. Ensuring that your yard is equipped with lighted pathways is a great way to ensure your friends and family are safe from accidents while on your property. In addition, burglaries tend to increase during the Holiday season, so it is important that your home is well-lit on the outside to deter any unsavory characters from picking your home as an easy target. Bring on the heat! Just because temperatures dip below freezing doesn’t mean you can’t enjoy an outdoor party. At Outside Landscape Group, this is one of the most popular winter-time projects we complete for our clients. 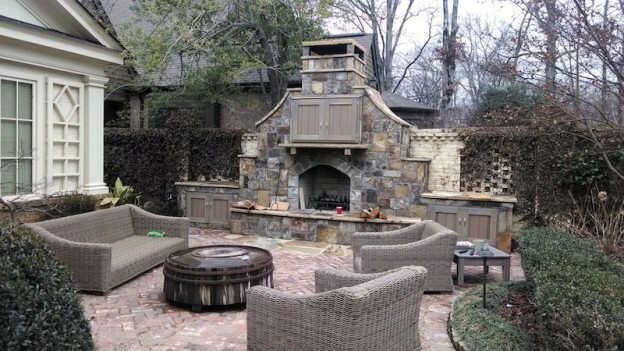 We can oversee the entire project for your outdoor fireplace or fire pit construction. 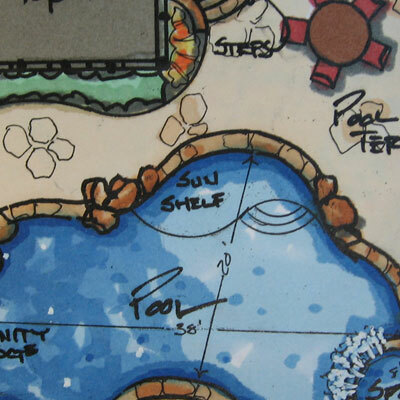 If you are thinking of building a pool or spa anytime soon, it is never too early to start the planning process. Many people decide they want a pool in March or April, but are disappointed when they realize that all of the quality pool builders in their area are already busy for the entire Spring and Summer! Designing and building the perfect pool that is well-suited to your yard is a process that takes time and careful planning. We work with our clients on every facet of the pool-building process to ensure you get a custom, high-quality pool that meets all of your needs and wants. When you landscape or re-landscape your current yard, the design phase can be time consuming, and you want to make sure that no detail is overlooked, and no stone is left unturned. This is why it is important to start the process early, and not wait until just weeks before you want to start your project. We work with clients in the Winter to develop a detailed landscaping plan that can be implemented in the Spring months. So don’t wait and feel “rushed” to get your landscape installed in the Spring. Trust the experts at Outside Landscape Group and get your project started this Winter! 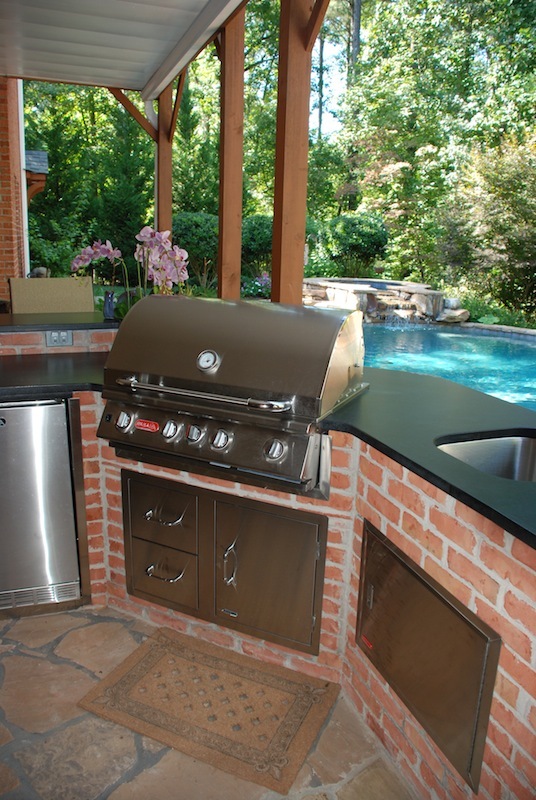 An outdoor kitchen is the ultimate symbol of outdoor entertainment with friends and family. I’m sure you can see yourself now…kids are jumping in the pool or throwing the football in the yard, while you and some of your buddies are grilling hamburgers or steaks for everyone to enjoy. If this sounds like something you would like to have in your backyard, it’s important to go ahead and start planning for it in the Winter months. Any kind of custom carpentry, masonry, or outdoor construction can be done in the winter time, and it is a great time to do so! Sometimes, your grass, flower beds, shrubs, etc. may be complete, but you need the right structure to bring it all together. At Outdoor Landscape Group, we believe that your landscape is part of your lifestyle, which is why having a great place for people to gather and hangout is essential. We offer a variety of custom carpentry services including decks, gazebos, pergolas, pool houses and more to meet your outdoor living needs. Winter is a Great Time to Landscape…So Why Not Put Us to Work for You? The Fall and Winter months are a great time to tackle a variety of landscaping needs that you have. At Outside Landscape Group, we help our clients 12 months out of the year with all of their landscaping needs. If you have questions, or would like to learn more about some of the services we provide in the North Atlanta area (Alpharetta, Roswell, Johns Creek, and the surrounding area) please give us a call, or contact us here today! It’s a question we’ve all asked ourselves before: how do you buy a gift for the person who has everything? It stumps us at nearly every holiday, including birthdays, Valentine’s day, and anniversaries. At a certain point, fine jewelry just becomes another piece of jewelry, a car just becomes a car, and so on. What can you give your spouse or significant other that they will cherish for years to come? Do you ever look at your yard and think, “Something is missing. I can’t put my finger on it, but it just isn’t quite right.” We can almost guarantee that you’ve heard your spouse or partner say the same thing! If you are wondering what in the world you are going to get that special someone in your life this year when that important occasion rolls around, here are 5 ideas that will transform your outdoor living space, and give your spouse a gift they can enjoy every day for years to come! One of the hallmarks of a beautiful outdoor living space is a fully functional, aesthetically-pleasing outdoor kitchen. Typically, this will include a grill, bar area for drinks and food preparation, refrigerator, and just about anything else that you would want to add. An outdoor kitchen is a welcomed addition to any home as it will likely increase the value of your home, and provide a relaxing area where you can cook and enjoy the outdoors year-round. If you are interested in learning more about outdoor kitchens for that special person in your life, click here to see our outdoor kitchens. Because of the climate we enjoy in the Alpharetta area, a swimming pool can be enjoyed for 6 months each and every year (more if you build a heated pool or spa). At Outside Landscape Group, we are equipped to build the pool of your dreams, and integrate it perfectly into your new landscape design. We are typically much faster at installing pools than traditional pool companies because we can also provide the hardscape construction and landscape design surrounding the pool area. To see some of the pools we have built for our clients, click here. If you’ve got a golfer or sports fan in your family, then a custom, high-quality putting green or sports court from Outside Landscape Group will be the perfect gift to absolutely blow them away. 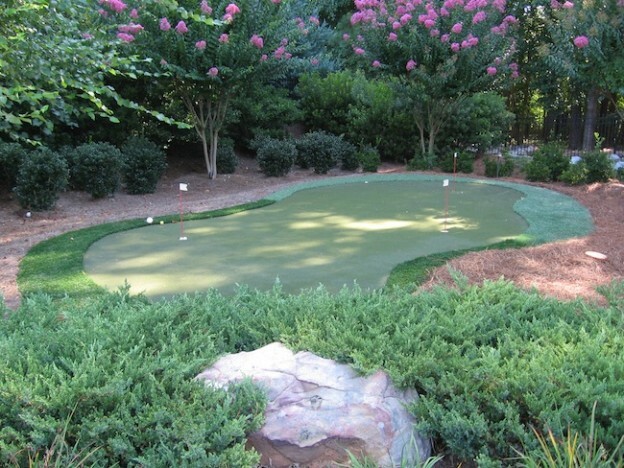 Every avid golfer dreams of having a putting green in his or her backyard, as it provides them with an area on-site to work on their putting and short game, as well as gives them the “status symbol” of being able to own their very own, high-quality putting green right in their backyard. This gift will be a thrill for the avid golfer or sports lover in your life, so visit this page to learn more about our putting greens and sports courts. It’s a cool February evening, and you’re enjoying a brand new outdoor fireplace with your spouse. They look over to you and say, “Isn’t this wonderful? Thank you.” All of a sudden, your heart melts because you know you’ve given your significant other a gift they can truly cherish for years to come. Building an outdoor fireplace or fire pit requires expertise, and special preparation and integration with your surrounding landscape. Shouldn’t you trust the experts at Outside Landscape Group who have done this hundreds if not thousands of times? Click here to see our outdoor fireplace creations. Last but not least, you could give the gift of a complete outside landscape design and renovation. As you can see by looking at our client before and after photos here and our process (as well as the wide variety of services we offer), make us the ideal choice to design and build the perfect landscape and outdoor living space to wow your family and friends. If you live in or around the Atlanta area, we encourage you to give us a call so that we can discuss your project. Maybe it’s time for a truly remarkable gift for the person in your life who has everything. If you’re looking for the perfect wedding anniversary gift, Valentine’ day gift, or birthday gift (or maybe you just want to say “I love you”), then let us help. Contact us here today! Close your eyes for a few seconds and picture a backyard that you’d absolutely love; a backyard that makes you feel that you’d rather spend time outdoors than be cooped up in your home. What do you see? A putting green that allows you to practice any time? A gourmet outdoor kitchen to entertain your friends and family? A cozy fire pit to warm up to on a cool night? A relaxing pool to cool off during the hot summer days? Whatever you dream for your beautiful, fully usable outdoor living space, we can most likely do. Here at Outside Landscape Group we offer several services and options to create an outdoor paradise of your own. Whether that means a peaceful, babbling water fountain or a full size basketball court to break a sweat, we can accomplish those goals. If your dreams include a relaxing, peaceful backyard, call us. We can make that happen. Our professionally trained and experienced team have completed many backyard projects to completely satisfy our customers. Check out our before and after pictures to see the quality work we do! You deserve a backyard treat (or two!). For all of those times throughout the year when you have guests, family, and friends come over, wouldn’t a nice fireplace or fire pit be perfect? We have several types of fire pits and fireplaces to suit your taste and style. The same goes for outdoor kitchens, water features, pools, and spas; we can implement your ideas to match your style. Now just imagine yourself getting home from a long day of work and soaking in the backyard spa. Doesn’t that sound nice? For those who love and admire true craftsmanship and beautiful landscaping, we can absolutely deliver results you will love. Our team loves creating gorgeous backyard designs to improve its appearance and functionality. Whether you want a custom pergola to add that finishing touch to your outdoor kitchen area, or you want beautiful shrubs and flowers for an elegant look, we can do it. Not only can we do it, but we will do it right. We are experienced in designing and installing outdoor landscape lighting to help extend your evenings of entertaining and provide a beautifully, well-lit entrance to your home with great curb appeal. Our team knows how to avoid common pitfalls with landscape lighting, irrigation, and installation. We help customers stay on budget with their projects and we can also help you design your backyard from scratch. We have many years of experience in the landscaping industry so that we can provide excellent results to you, our customer. If you are ready to take charge and redo your backyard, call us. We have a seamless, quick process to get started and have your project finished in no time. Call our professional landscape design company in Alpharetta and we’ll transform your boring backyard into a perfect oasis you’ll love.